Despite today people are living longer, healthier, and happier lives than ever before, there are still many problems that humanity should address. One of the most important of them is the water inequality. While people in First World countries can very easily take fresh, clean water for granted, more than 800 million others in impoverished areas have no access to any clean water source. It is a common occurrence in some regions for people to defecate openly, walk more than 30 minutes to access clean water and share toilets with other humans. In 2018, is this really something that we should just accept as an inevitable way of the world? Nature’s Water, providers of water treatment systems throughout Ireland has published a very detailed infographic titled “Addressing the World’s Water Inequality Crisis”. You can see the infographic below. 11% of the world’s population (more than 800 million people) do not have access to any drinking water service. At least 2 billion people (more than 25% of the world’s population) people use a drinking water source contaminated with feces. 263 million people face a round trip of more than 30 minutes to collect drinking water. 2.3 billion people lack basic sanitation from their toilets. Every year, more than 500 million people die from diseases transmitted from contaminated water like diarrhoea, cholera, and typhoid. And no, saving lives does not lead to overpopulation. By 2025, half the world’s population (at least 4 billion) will live in water-stressed areas. Reducing Fossil Fuel Use. If we reduce the fossil fuel consumption and use renewable energy sources instead, water consumption and carbon emissions would drop significantly, thus increasing the supply of clean water throughout the world. New water purifying technologies. An American student, Deepika Kurup (born 1998) devised a method of using zinc oxide and titanium dioxide in containers which would expose it to ultraviolet radiation and sufficiently purify contaminated water to make it drinkable. Her initial idea that won her the Discovery Education 3M Young Scientist in 2012. She improved her method and after 3 years developed a pervious photocatalytic composite using sand, TiO2, Portland cement and silver nitrate This photocatalytic pervious composite showed a 98% reduction in total coliform bacteria immediately after filtration. Exposure of the filtered water to sunlight with a photocatalytic composite disc resulted in 100% inactivation of total coliform bacteria in just 15 minutes. This project won her the 2014 United States Stockholm Junior Water Prize. She also is the National Geographic winner in the 2015 Google Science Fair. Another example: in the video below, Bill Gates got to check out the Omniprocessor, an ingenious machine designed and built by Janicki Bioenergy, which turns human waste into water and electricity. In places without good waste treatment plants, it could be a real game-changer. Bill Gates recently got to check out the Omniprocessor, an ingenious machine designed and built by Janicki Bioenergy, which turns human waste into water and electricity. In places without good waste treatment plants, it could be a real game-changer. Reducing water leakage. Some utility companies are working on leak monitoring technology which can identify areas where water is leaking and report this instantly. Using less water. Manufacturers could replace water in some industrial applications with carbon dioxide, with highly propelled dry ice particles capable of cleaning surfaces just as effectively as water. At homes, homeowners could invest less water-consuming devices such as eco-friendly showers which can produce hot water within seconds of being switched on, preventing a lot of water from being wasted from long waits for it to reach the desired temperature. Portable, water-purifying bottles. It is a concept which originated from Michael Pritchard in response to the Indian Ocean tsunami of 2004 when survivors could not drink from the contaminated flood waters. These bottles use a pump to push water through an extremely thin filter which removes bacteria and viruses. Education. Educating children about the importance of sensible water usage in their formative years in school. 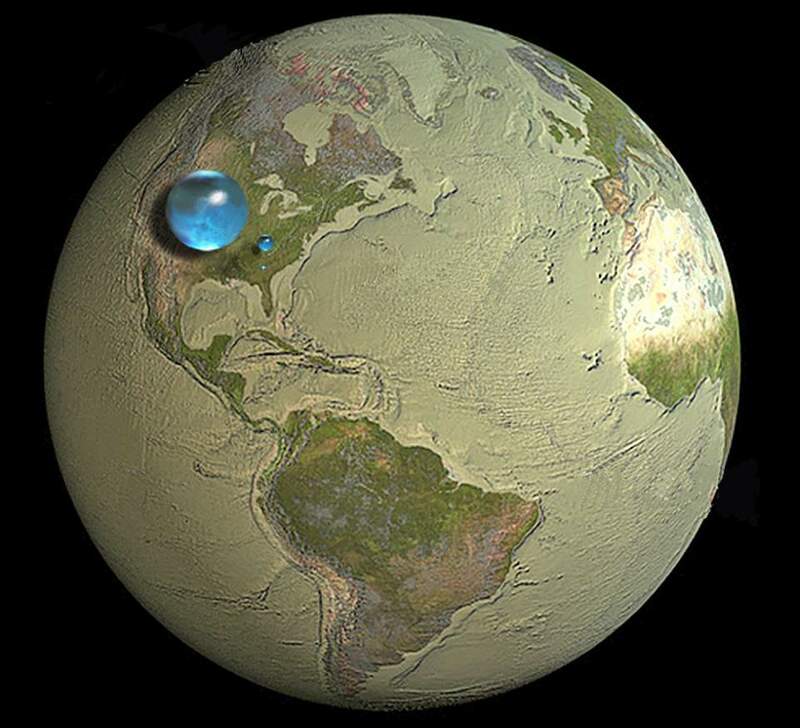 The drawing below shows blue spheres representing relative amounts of Earth’s water in comparison to the size of the Earth. Are you surprised that these water spheres look so small? They are only small in relation to the size of the Earth. This image attempts to show three dimensions, so each sphere represents “volume.” The volume of the largest sphere, representing all water on, in, and above the Earth, would be about 332,500,000 cubic miles (mi3) (1,386,000,000 cubic kilometers or km3), and be about 860 miles (about 1,385 kilometers) in diameter. The smaller sphere over Kentucky represents Earth’s liquid fresh water in groundwater, swamp water, rivers, and lakes. The volume of this sphere would be about 2,551,000 mi3 or (10,633,450 km3) and form a sphere about 169.5 miles (272.8 kilometers) in diameter. Yes, all of this water is fresh water, which we all need every day, but much of it is deep in the ground, unavailable to humans. 3. Fresh-water lakes and rivers (sphere over Georgia, 34.9 miles/56.17 km in diameter). Credit: Howard Perlman, USGS; globe illustration by Jack Cook, Woods Hole Oceanographic Institution (©); Adam Nieman.